The Holocaust is a constant reminder of what happens when we allow biases and prejudices to get the best of us. It is also a constant reminder of the ethical issues and dilemmas that we deal with as a society. Holocaust and Genocide Studies (HGS) plays a large role in this because it allows for us to educate ourselves on what it means to truly believe in something. 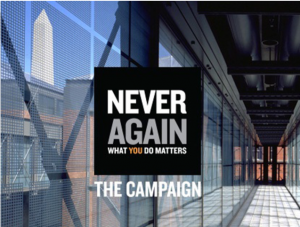 With the formation of the “Never Again: What You Do Matters” campaign in 2015 by the United States Holocaust Memorial Museum we are reminded that our thoughts and actions do matter in the lives of others and are a true reflection of ourselves. The message speaks for itself because what we do truly does matter. Countless events that have happened throughout history have happened due to the actions of many people. Every day actions even have an effect on others such as the interactions that you have throughout your lifetime. 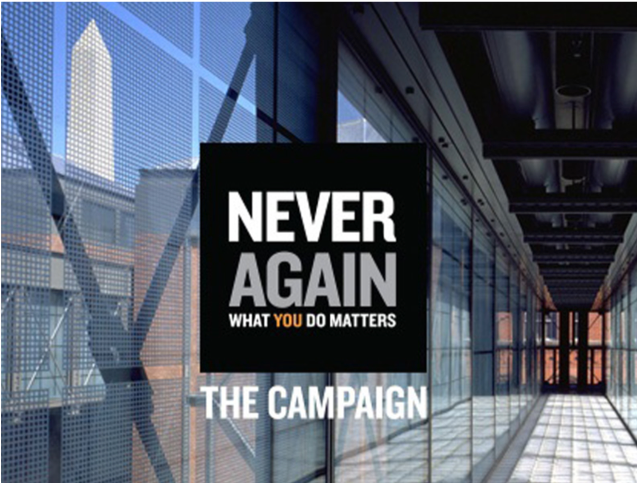 This campaign reminds us of the horrors many people faced in the Holocaust and we need to stand together to never let this happen again. As a Sport Management major, HGS ties into my lifestyle in many different ways. A major way it ties in is best explained by an article published by UNESCO at the beginning of this year. The organization explains that HGS is vital in helping us examine the “human possibilities in extreme and desperate situations” and “demonstrates the dangers of prejudice, discrimination, and dehumanization” (2018). This means that the organization is trying to show that HGS shows us the true nature of human life, interaction, and how far it become when it is tested. If we are not able to study and reflect on these societal behaviors and tendencies that led to this major event then we are selling ourselves short of not only reassuring that this does not happen again but that we contribute to our entire society does matter. This is important in the sports atmosphere of Sport Management because you are dealing with very diverse groups of people who come together for the love of sport. Sports are one way in which people of different ethnicities, religious beliefs, sexual orientation, etc. come together to achieve one common goal: to play for the love of the game. It is important to become educated on these events so that we can better understand where prejudice and ethical beliefs tie into everyday activities such as sports. Although HGS is not a part of my major it is central to the ethical issues that are discussed in the worldwide of sports and other events that happen every day. Although the understanding of ethical issues and prejudice at hand is important, aspects of HGS receive backlash in any aspect of life. An example of this is the debate on whether the Holocaust happened at all. As mentioned in our Holocaust and Genocide Studies class there are people who choose to let their ethical beliefs get the best of them when it comes to this subject. These people are the groups that are insensitive to the prejudice and biases that groups of people face on a day to day basis. It is hard to talk about HGS without receiving some form of backlash because you will always have someone who will clash with you in regards to ethical views and beliefs about life in general. According to a poll carried out by US News, a large number of people did not believe in the Holocaust or were not aware of the tragedies many people faced during this time period. Part of the poll went as far as to show that there are many people who are anti-Jewish as well, leading to these beliefs and biases. This information is interesting to look at it because it shows the different ideas that construct our society. For groups of people not to believe what happened in the Holocaust or the concept of HGS threatens what it stands for. The article goes on to say that “to this group, the Holocaust is a lie, a myth, a hoax, a conspiracy by those with a political or ideological agenda” (Nesbit 2014). This shows how important HGS is in our everyday lives and academic fields of study because half of the world is still blind to the ethical issues that happened in this time period. It is important to understand the opposing side when studying the Holocaust because you need to understand the other perspectives in this field of study. HGS spans from not only its own field but to everyday activities such as ethical beliefs and issues in sports that I deal with as a Sport Management major. Behavior and ethics in Sports is always being researched and spoken of so it important to be educated on the matter. In fact, it is truly a reflection of our society as a whole. Brooke Ripley, a resident of Baltimore, Maryland is currently a senior Sports Management major at Old Dominion University. 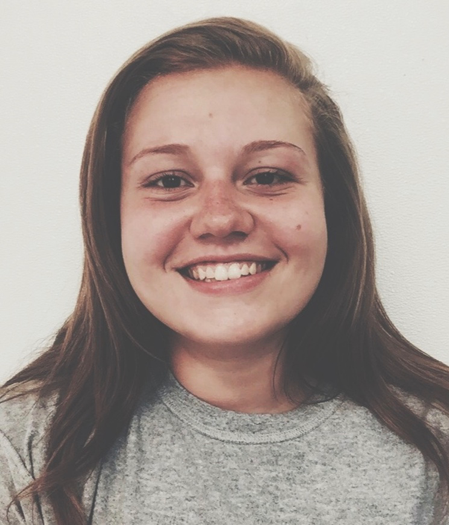 Along with her academic interests, Brooke is a member of the varsity rowing team and has received honors such as All Big 12 Academic Team and Commissioner’s Honor Roll for Conference USA. Brooke is passionate about sports and intends to acquire a masters in Sports Management after graduation from her undergraduate career. She hopes to someday pursue a career as a collegiate rowing coach in the sports industry.